This Frag Platter is a new shape in the Husque Collection by Marc Harrison. Every piece in the collection is inspired and derived from the macadamia nut. The material used is a mix of finely ground macadamia nut shells and a polymer which create these sustainable works of art. The inspiration in design comes from the very nature of how the nut's shell falls open when cracked. 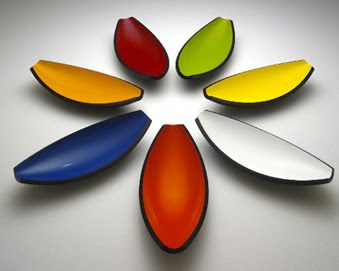 This particular piece, the Frag Platter, makes an amazing center piece, adding color and intrigue to any room.